Heading out to the jungle town of Rurrenabaque, we had to make a choice: take a bus for 24 hours along parts of the infamous “deadliest road in the world”, or a small charter plane for 45 minutes. Our decision was to take the plane. With only 18 passengers on board not including the pilots, this plane was smaller than the almost all of the buses we were taking throughout South America. 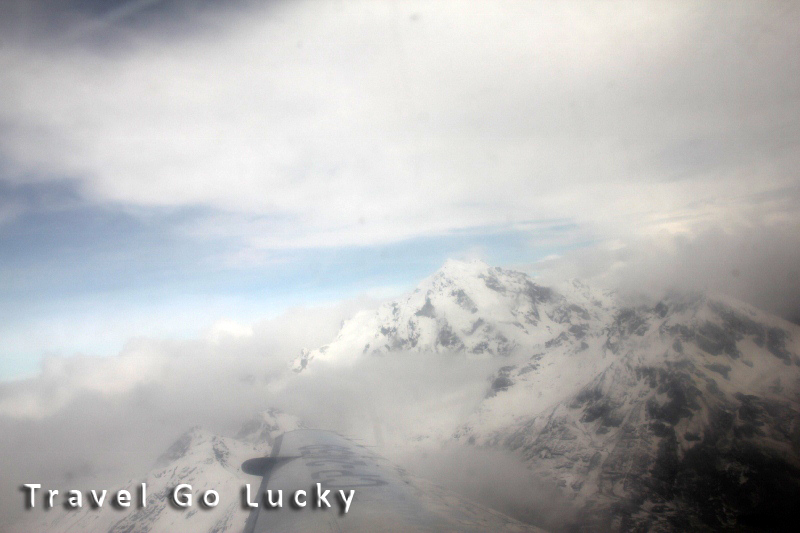 I was a bit nervous because of the size, but it was exciting because we flew right over a section of the snow capped Andes mountain range, and before you knew it we were right in the middle of a thick, dense jungle. 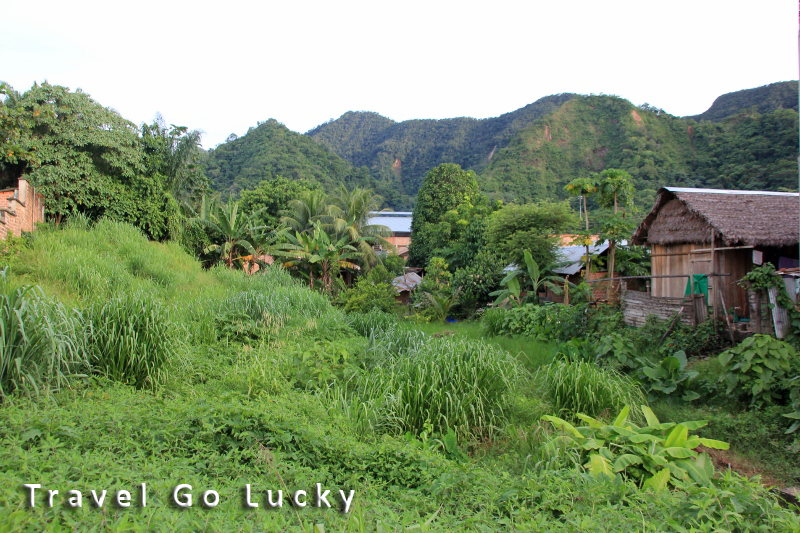 ...and a half hour later we were in a town bordering the jungle. Crazy! 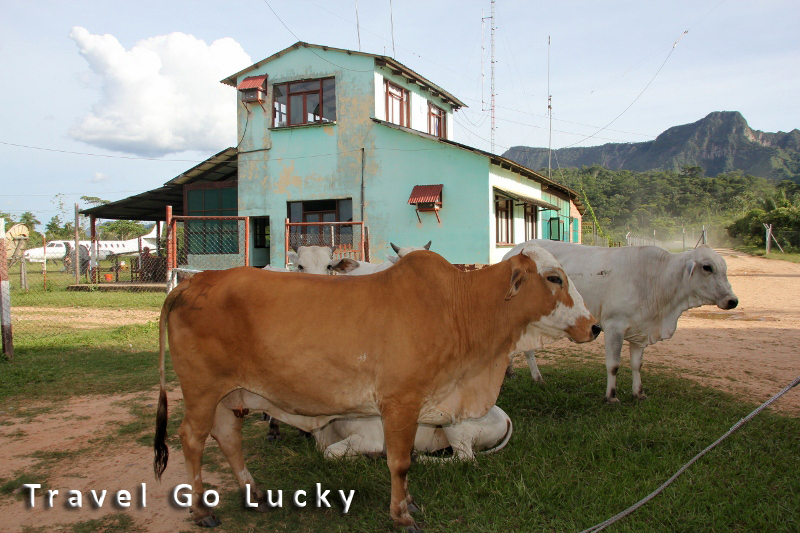 Once we landed we were greeted at the shack of a terminal with swarms of mosquitoes, cows, and unbelievable humidity. It was a complete change from the chilly weather in the mountains we just left. 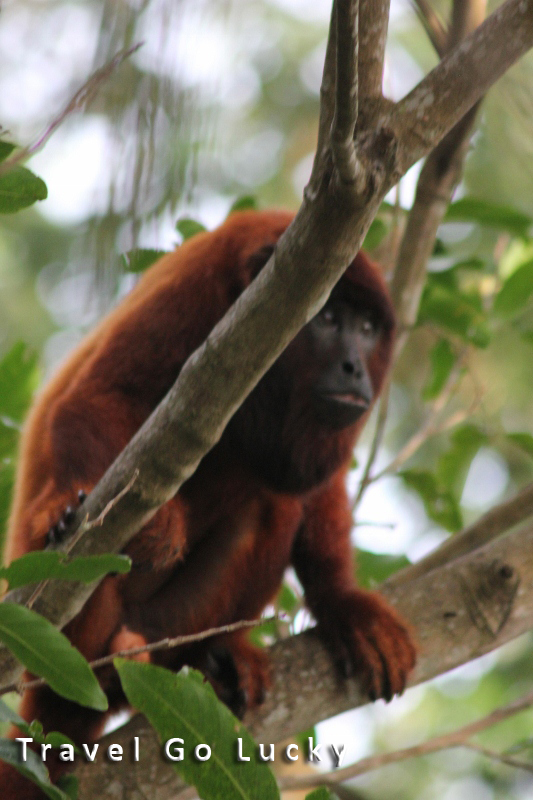 Rurrenabaque is a small village next to the Yacuma river in the Amazon that borders Madidi National Park, home to 11 percent of the world’s bird species. We originally had planned on visiting Madidi, but because the rains were so bad this season, all of the eco-lodges were wiped out by flooding. 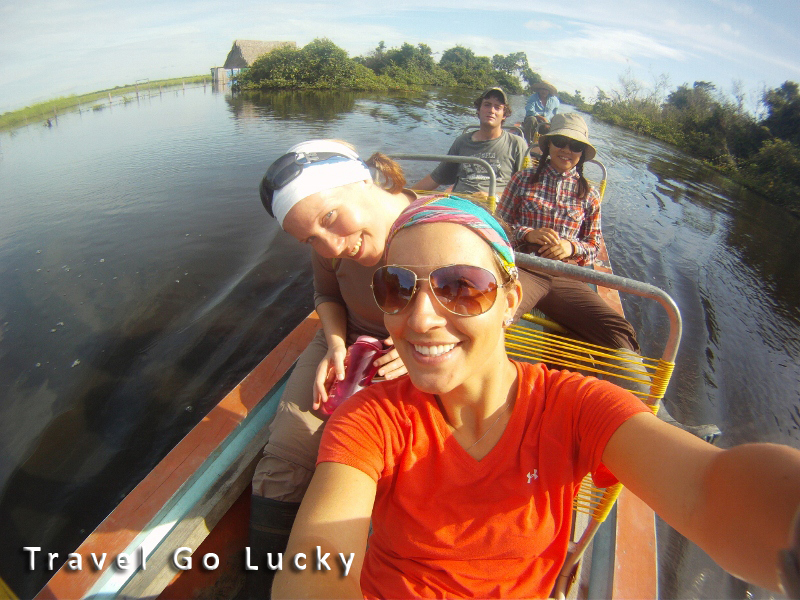 The tour operator also mentioned we were better off visiting the “pampas”, or swampland, as this is where we would see much of the wildlife we associate with the jungle anyways. The four of us (Team America and Team Finland) had signed on to take a pampas boat tour for a few days in hopes of seeing some unique wildlife. That's a plane, cows, and the "terminal"... all in the same photo. 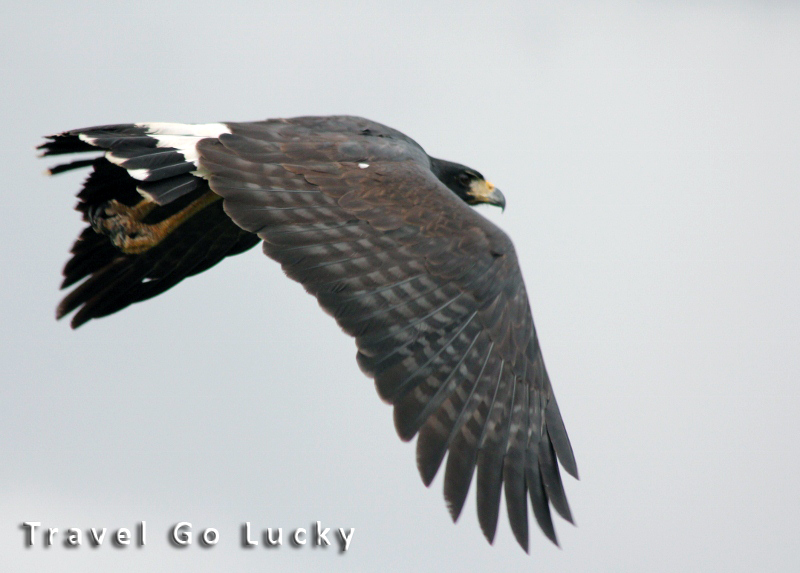 The Pampas are the fertile South American lowlands that cover more than 289,577 sq. 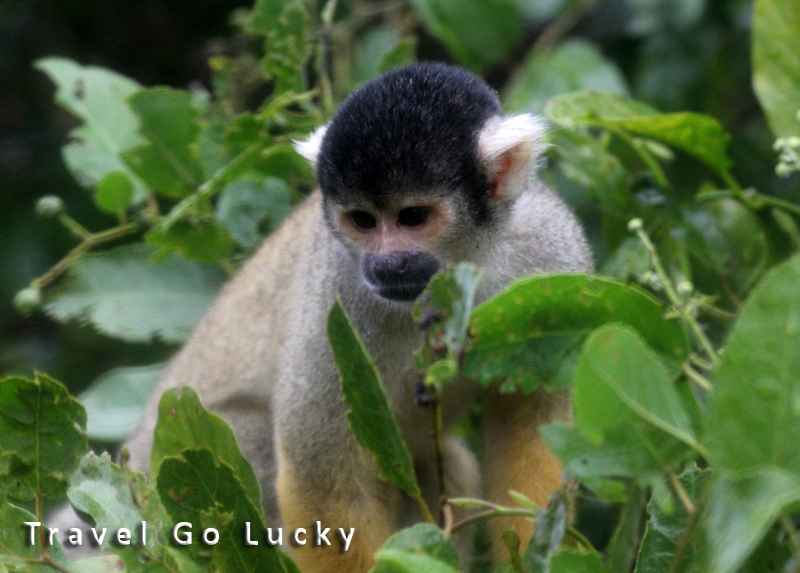 mi and are located mostly in Brazil, Peru, Bolivia, and Paraguay, providing habitats to many rare and indigenous animals. 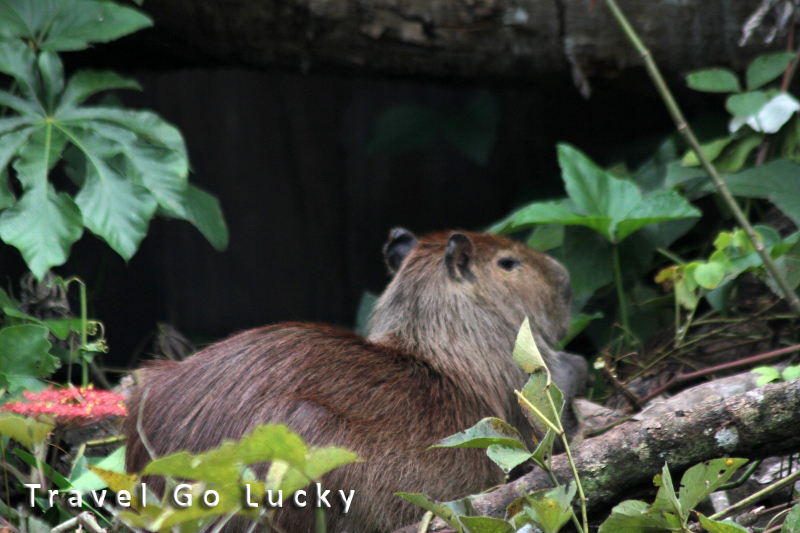 Adam and I were looking forward to seeing toucans, parrots, sloths, pink river dolphins and the largest rodent in the world, the Capybara. 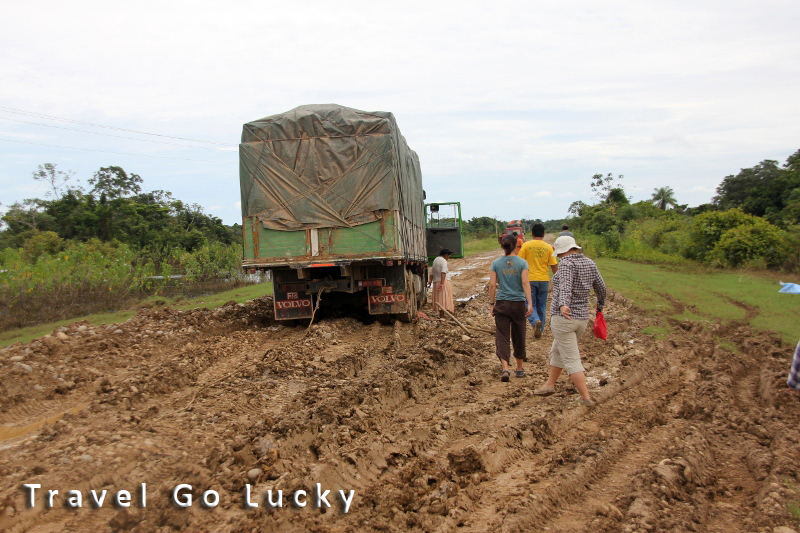 Unfortunately, we had an uncomfortable and dangerous Land Cruiser ride out to the drop off point ahead of us. This region of Bolivia has seen torrential rains for the past few months, with many families losing their homes and many crops that have been destroyed. It was a very sad sight to see families camped out on the side of the roads, living underneath makeshift tarp tents. Our four hour drive seemed like it took four days. Not only was the road all mud and rocks which made for an extremely bumpy ride, but we crossed over a dozen rivers that were all created by the heavy rains. There's mud, and then there's MUD. Definitely a top 10 worst road of the trip. Once we arrived to our drop off point we spotted the pink river dolphins right away. It was so peculiar to see dolphins in a muddy river. They look similar to the grey dolphins but are noticeably larger and no longer need the grey pigment in their skin and that is where the pink color comes from. These river dolphins are also on the endangered species list because of pollution, over fishing and excessive boat trafficking. They were hard to spot because they would only come up for air every so often and the waters were so muddy that you never knew where they would pop up. Once we hopped on our small boat on the river, the clouds started moving in quickly. We spent about an hour or so in a torrential downpour. It was a little disappointing but what do expect in a “rain” forest, right? We arrived to our lodge which looked like a floating, abandoned house in the Everglades and made our way to the bedrooms where we laid out all our clothes to dry faster. The humidity here was off the charts, and living in Florida I like to think I know a thing or two about humidity. Adam was very excited to photograph all of the animals, but nervous about the sudden downpours possibly wrecking his camera gear. 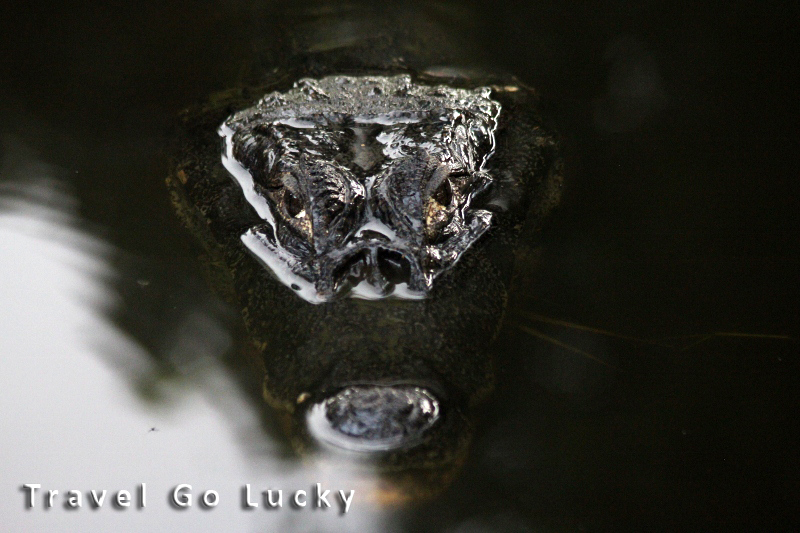 The first night after dinner we took a nighttime ride to spot the eyes of the caimans. 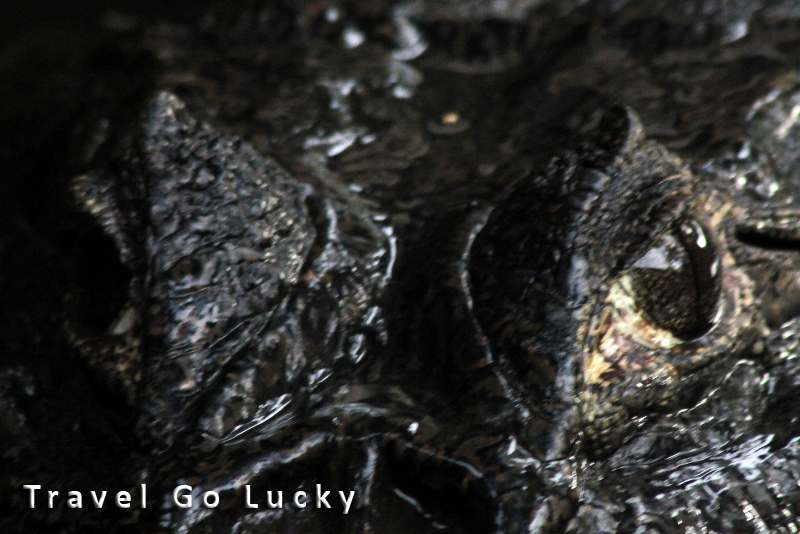 It was like a game of where’s Waldo because they were hard to spot unless you had the flashlights directly at their faces and the eyes would shine back a vibrant red, which is why they are called blood caimans. 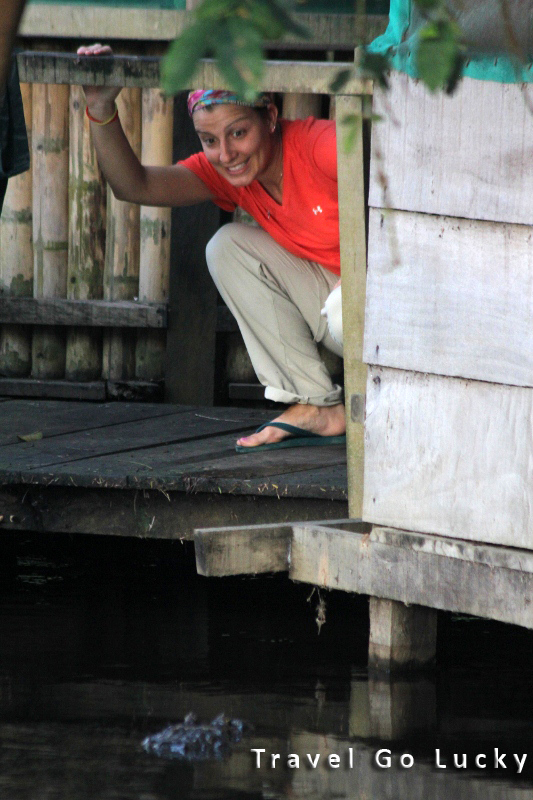 We had a caiman who always hung out by our floating lodge and we all named him Fred, we got some great photos and video of him, as he was pretty active during the day. This is Frederico, or Fred for short. Dana and Fred hanging out at our "lodge"
Day two we woke up to howler monkeys which was pretty amazing (and creepy- Adam thought they sounded like the Apocalypse was upon us- whatever that sounds like). 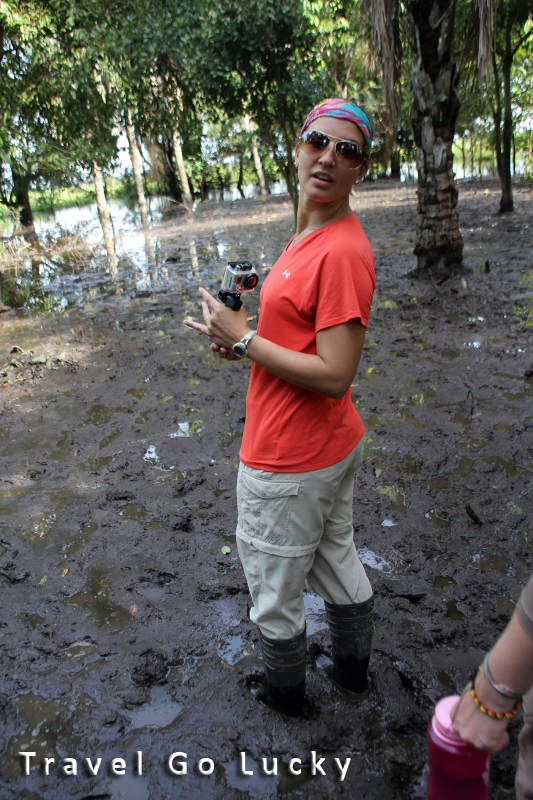 After breakfast and visits from Capuchin and Squirrel monkeys, we were given rubber boots because it was time to track Anacondas. I was really nervous because I’ve seen on TV how big these guys can get, unfortunately we only were able to see baby one’s. It was really hard to walk in the foot deep mud, it almost felt like quicksand, I didn’t last long in this outing. Plus one of my boots was leaking, I didn’t check for holes, and the warm stinky muddy water was disgusting squeezing between my toes. Dana sure is tough-- that mud sure didn't smell like mud. Later that day we were scheduled to swim with dolphins and then try to fish for the piranhas. Just the mixture of the two words dolphins and piranhas made me nervous, I really tried to get the courage to jump in. Our guide and another guy of our group did it, but I couldn’t gather enough guts to do it. Anu, Tuula, Adam and I made up every excuse in the book , it was really funny. (The water is too cold, the dolphins aren’t getting close enough, are there piranhas around us now?, the sun isn’t even out right now, how deep is the water?) We tried to fish for the piranhas on our way back, but no one had a bite. Our guide informed us that the piranhas are blind during the rainy season because the waters are so dirty, it’s almost impossible to catch them. I wish we would have been able to catch at least one, just to see how big they were in this river. On our way heading back to camp we saw a sloth and were able to see firsthand how slow these guys actually move, really really slow. 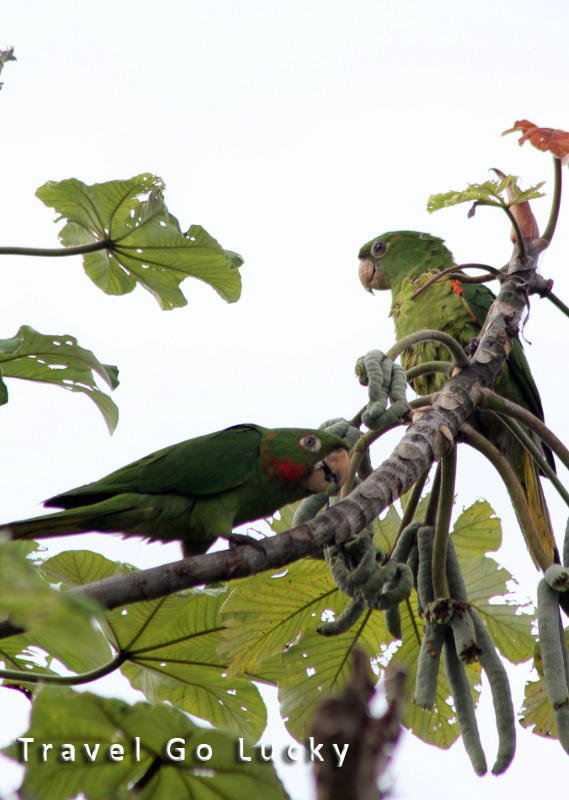 We even saw a few parrots fly above us which is breathtaking to see in the wild. Unfortunately, Adam didn’t bring his SLR, because we were afraid the boat would tip when we were going to swim with the dolphins. It was very disappointing because we never got a photo of the sloth or the birds that evening. 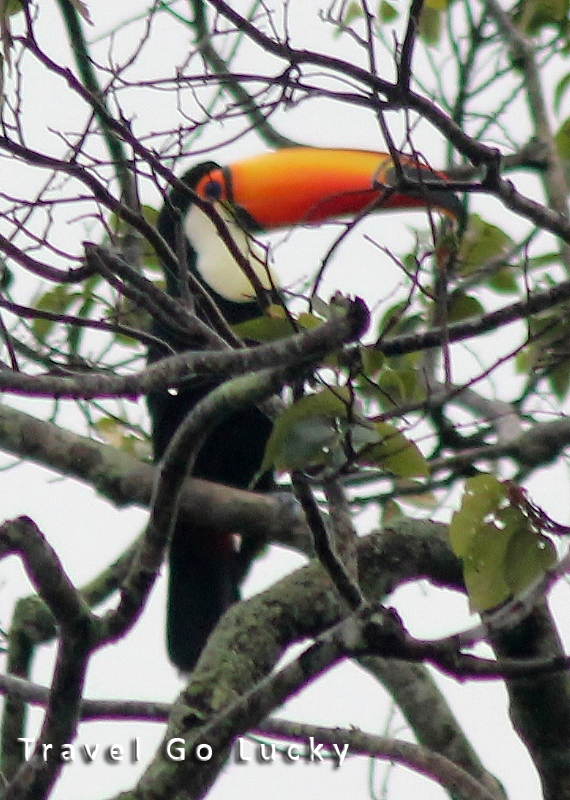 The last day of our tour we headed out early for bird watching in hopes for parrots and toucans, and we were in luck. 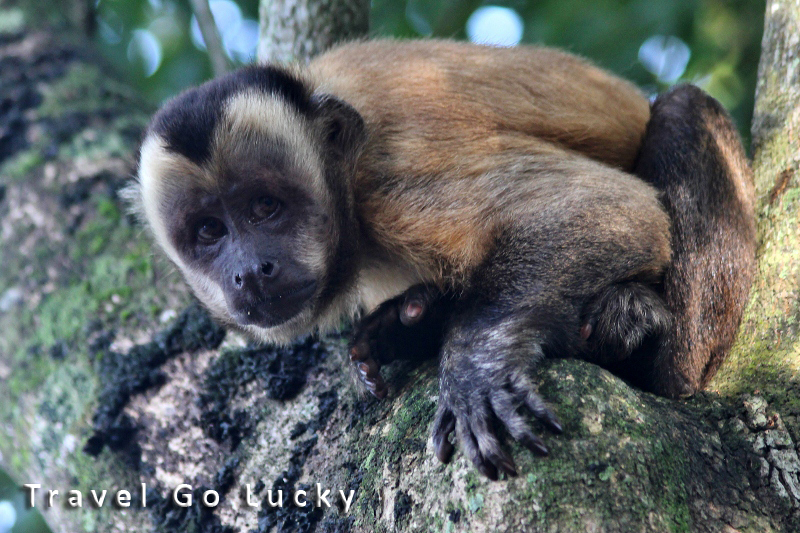 Adam took some amazing snaps of the birds, we even saw large Capybara, turtles and Caimans’ sunning themselves and some other strange looking birds. 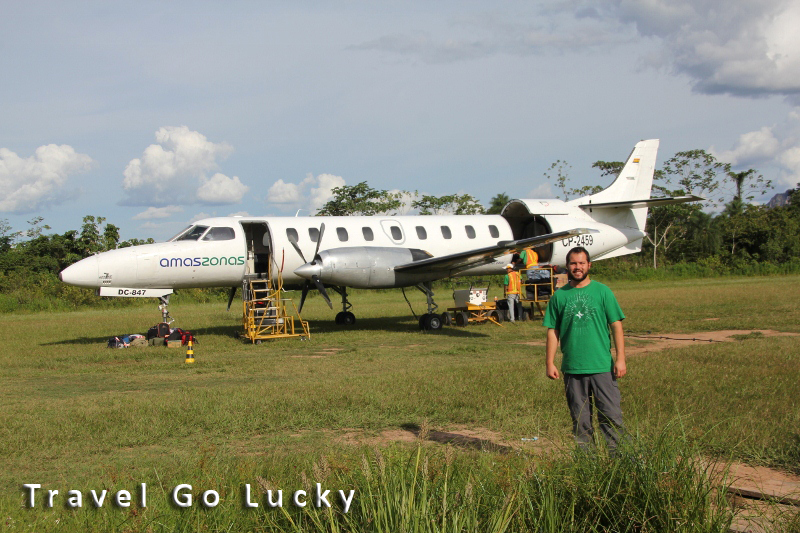 The tour was a great introduction to Amazon for both Adam and I and we look forward to coming back someday to explore Madidi National Park, just not during the rainy season. The world's largest rodent- the Capybara. About the size of a sheep! Fred requested one last closeup before we left. 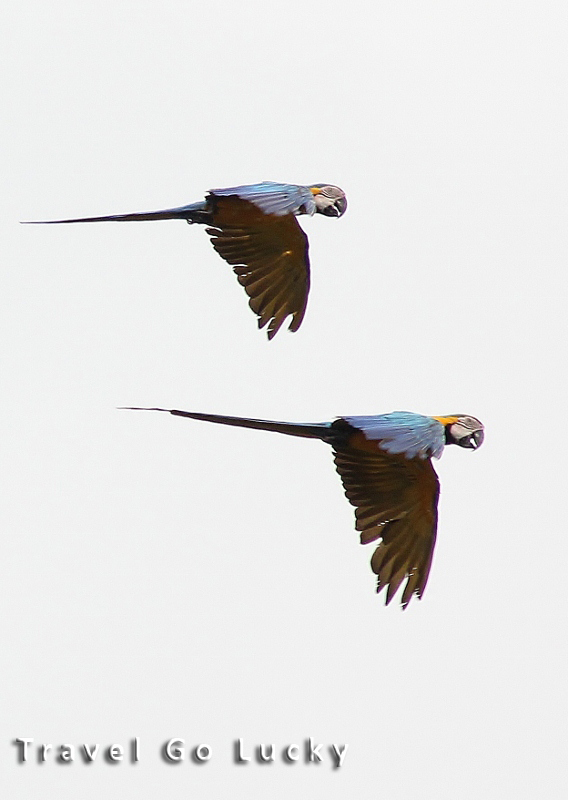 Highlight #1: Blue and Yellow Macaws in the wild, flying in tandem. INCREDIBLE! 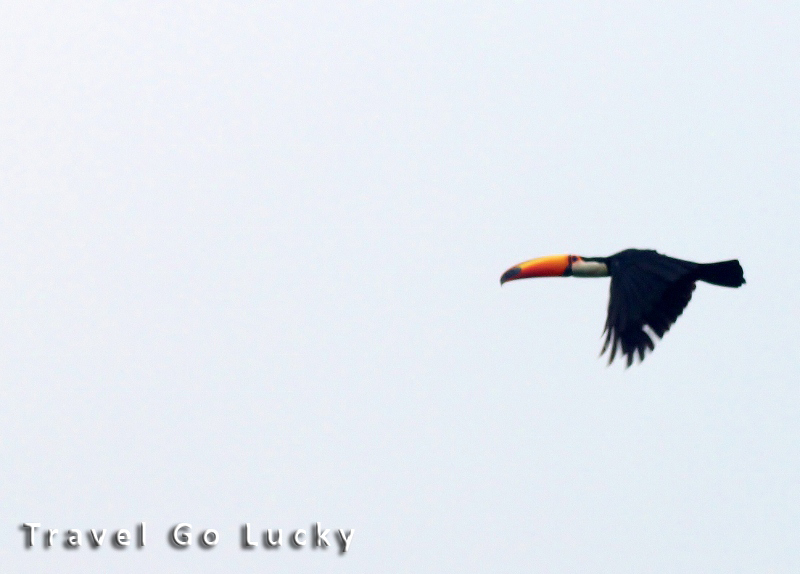 Seeing the Toucan in flight was really special! 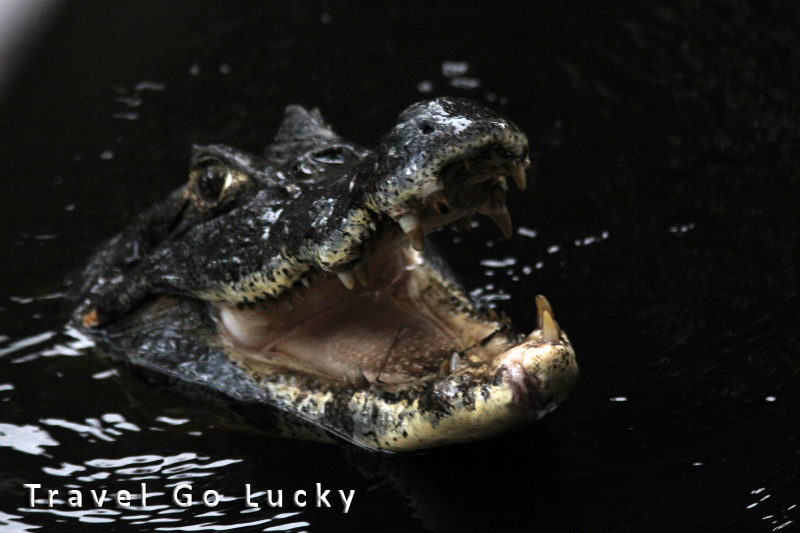 This entry was posted in Bolivia and tagged Bolivia, Caiman, Capybara, Jungle, Pampas, Parrots, RTW Travel, Rurrenabaque, Swamp, Travel. Bookmark the permalink. 4 Responses to Welcome to the Jungle… THE SEQUEL! You’ve had some super-GREAT photos! Wow! Glad you’re still smiling! Dad and I went to see “Rio,” an animated movie about a Blue Macaw, and you would love it. Really cute! You’ll have a lifetime of stories to tell about this past year! Even tho I was skeptical about your going on this trip, I will truly miss reading about your adventures! Wish you could make this blog into a book. I’d buy one! Love you both! When I grow up I want to be just like you guys! I love reading your posts, and the pictures are so great I feel just like I am there! :] Thanks for sharing! Thats a Fairchild Metro airplane, and I believe I worked on that 20 years ago. Crazy as it seems I took many flights on that airplane myself.